시안, 중국의 서안 인터내셔널 파티 호스텔 | 호스텔월드에서 예약하세요. 번역 Shuyuan 국제 파티 호스텔은 거 대 한 야생 거 탑과 비림 박물관에가는 지하철에서 약 5 분 거리에 위치하며, 이슬람 분기 및 섬서성 역사 박물관에서 도보 거리에 있습니다. 이 호스텔은 바, 레스토랑에서 무료로 매주 바베큐 파티와 만두 파티뿐만 아니라 서양 요리를 제공합니다. 한 Hostelworld에 게스트 당신이 무엇을 선택 조용한 대화, 탁구의 게임, 또는를 가질 수 많은 장소가 아직도있다, '그것 \에도 불구하고'의 파티 호스텔이라고 말했다. 그것은 \ '다른 여행자를 만날 수있는 좋은 장소를 SA'. 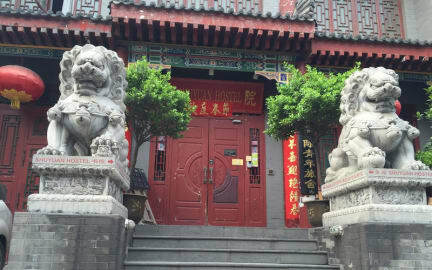 Shuyuan is Xi’an’s original backpackers’ hostel, and though often imitated we’re never duplicated. We’re perfectly located in the heart of the flourishing cultural and shopping district. The location is definitely the best in Xi’an, as it's so central and easy to find everything; you truly are in the heart of Xi’an culture. The hostel itself is a rare, preserved traditional Chinese courtyard house, an original and not a recently rebuilt imitation building. We have several outdoor and indoor seating areas with a very relaxing atmosphere, including our chill-out garden plus a popular café, free Wi-Fi, very friendly staff, a great atmosphere and lots of travellers. All of our staff speak English and will do their best to make your stay in Xi’an as comfortable and accommodating as possible. In that same spirit we also offer a full host of tours and guides to Xi’an's most famous sites. If it is off the beaten track you are looking for than we can help you there, too; many of our staff are travellers themselves and know what it is travellers are looking for when they come to a new place! We offer budget tours to local tourist sites including the Terracotta Warriors and the panda conservation centre, along with flights, trains and permits to Tibet. We can also arrange tickets to a Tang Dynasty dancing and singing show and the cheapest Yangtze River cruise tour around. Ask us about our car services! Here at Shuyuan we try our best to make your experience in Xi’an as memorable as possible. The free welcome coffee or tea, we take every opportunity to make you feel welcome and relaxed. Every Friday night we hold a free dumpling-making party, a perfect opportunity to get to know new friends and Xi’an's culinary traditions.. Mixing Western and Chinese style, it's a candlelit affair with music and plenty of fun. And—as always—we have free 24-hours Wi-Fi. We also have one of Xi’an's most popular bars in-house. Park Qin bar is a place where locals and travellers mix, laugh, and enjoy the evenings. Newly renovated, it’s been featured in the local ex-pat magazine and has gained recognition as one of Xi’an's premier bars. We provide many free services, including free train station pick-up (6.30am-9am; inform us in advance), a library of English books and guidebooks, luggage storage, domestic and international plane ticket booking, travel info, hot showers, local area maps, delivery and a DVD room with a wide selection of subtitled movies. Not to mention our free billiards, dart board, guitar and table tennis! 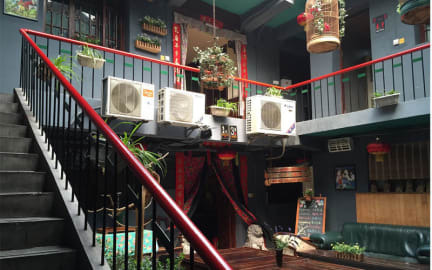 We also feature laundry facilities, a bike-hire service, airport pick-up and transfer, live sports matches and news, international IP calling cards and an onward booking service for other popular hostels throughout China. Here you can exchange books (2 for 1) and burn DVDs and CDs or send a fax. We serve a western-style breakfast with black coffee, cappuccino, latte or espresso. 서원 호스텔 정말 맘에 듭니다. 처음에 픽업문제로 트러블이 좀 있었지만, 친절한 직원들 덕분에 그런 부분은 다 상쇄가 되구요, 위치도 좋고 약간 오래된 듯한 분위기가 맘에 듭니다. 직원들이 정말 친절하게 대해주셔서 거기 머무는 동안 기분이 좋았어요. 서원의 중국식 조식 부페 꼭 먹어보세요, 바쁜 일정에 한 번 밖에 먹지 못해서 너무 아쉬웠어요. 시안에서 아늑하고 안전한 숙소에 머무르게 되어 정말 감사하게 생각합니다. 번역 정말 특별한 우리의 숙소는 우리가 손님을 제공하는 독특한 경험을 만드는 것 같아요. 우리는 아름다운 중국의 전통 정원으로, 도시 벽을 직면하고 카페 우수한 서양식 음식, 특히 피자를 제공. 정말 성벽뿐만 아니라 JingDi의 무덤 (한양 링)을 탐구하는 것이 좋습니다. 또한 인근 벨과 드럼 타워, 이슬람 분기 돌판 박물관입니다.